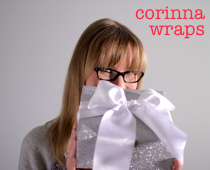 This post was originally published in Corinna’s monthly Gift Wrapping Newsletter. Sign up here! Nothing pulls down the look of a beautiful present faster than frayed ribbon ends. To get crisp cuts so your gifts look their best, here’s what what not to do — and how to do it right. Cut straight across or use dull scissors and your ribbon ends will look like a hideous mess. When you cut straight across the ribbon, you’re cutting with the grain of the fabric, which makes it more likely to fray. Dull scissors will tear and break the fabric threads instead of making a clean cut; the result: jagged, frayed ends. Fabric ribbons are less likely to fray when cut on an angle. Using sharp scissors, cut from one side of the ribbon to the other, at an approximately 45 degree angle. One quick snip is best; going slowly and opening and closing the scissors increases the likelihood of a crooked line. To get a V-shape end, fold the ribbon in half lengthwise. Then cut across the ribbon at an approximately 45 degree angle, starting at the folded side and cutting upwards toward the outer edges. NOTE: I almost exclusively use fabric ribbons. Fraying isn’t an issue with polypropylene curling ribbons (which I’m not a big fan of), but they still look better when cut on an angle, as in version 1. Want to master the art of gift wrapping? Learn all the basics in Corinna’s hands-on Gift Wrapping 101 workshop, Dec. 7. This class has already taken place.